By Merryl Gelling, post-doc researcher at WildCRU and Mammal Society Council member. There can be no denying that the water vole, although physically fairly small, has the biggest ‘cute’ factor of all our UK mammals. At first glance they may be confused with the brown rat, but once you look more closely it is impossible not to be won over by the water vole’s appealing face and overly large feet! A distinctive resident of our river banks for hundreds of years, the water vole has been immortalised as ‘Ratty’ from the Wind in the Willows. Water voles are named to reflect their preferred habitat of river banks swathed in lush riparian vegetation, and also their ability to swim. Each vole inhabits a territory of approximately 70-130m of river bank, where they dig an extensive network of tunnels in which to rest and raise their young. Burrows usually have an underwater entrance to allow a quick escape route from terrestrial predators, and often the distinctive ‘plop’ as an animal jumps into the water is the first indication of their presence. In fact, water voles spend so much of their time at the interface between the banks and the water that their latin name has recently changed from Arvicola terrestris to Arvicola amphibious. 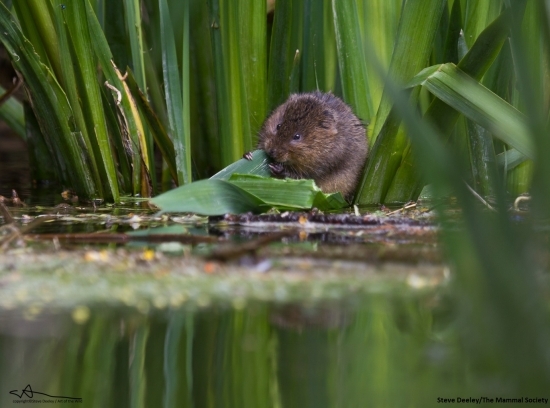 Once common across the UK, the impact of a change in land-use and riparian habitat management since the 1900s, resulted in a measurable loss of water voles at individual sites surveyed during the 1980s. This pattern increased steeply throughout the 1990s, resulting in a dramatic regional declines in water vole presence. The River Thames catchment had a 72% site occupancy in 1990, which fell to only 23% site occupancy in 1995 (Water Vole Conservation Handbook, 2011), and this pattern was repeated across the country. As a result, water voles are legally protected in Britain and are a priority species. Reasons for this significant loss are a combination of habitat degradation, population fragmentation and predation by the introduced American mink, with environmental factors including droughts and flooding, and pollution also contributing to their decline. Happily, habitat management and mink control provide viable tools for sustaining local populations. As a result, ‘Ratty’ is slowly returning to feel the Wind in the Willows once more across the UK. However, there is still a lot to do before water voles are safe. This year the Mammal Society launched a Save the Water Vole appeal to fund research investigating how to help boost the return of water voles. This has already been put into effect, by conducting research alongside Oxford University’s WildCRU and other partners, to advise UK licensing agencies of the best ways to protect water voles that may otherwise be impacted by development projects. I’ve been privileged to undertake research on water voles for much of my career, and have often watched them feeding quietly in the reedy fringes of slow-moving water, or swimming diagonally across the channel, riding characteristically high in the water, or heard them ‘plop’ into the river as I’ve walked past. These are sights and sounds that were once common-place on many waterways for all to see, but are now increasingly rare. Water voles are a crucial part of our river ecosystem in the UK and as such need every possible helping hand to survive. They are well on their way to becoming one of the UK’s biggest conservation success stories, and every vote for them is another step in the right direction – who wants to explain to our children and grandchildren that it was our generation that allowed ‘Ratty’ to become part of our history, rather than a thriving component of our ecosystem? A vote for the water vole is a vote well made! 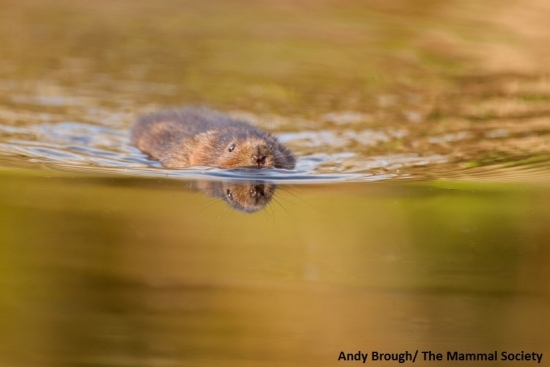 Comments Off on The water vole: can we save ‘Ratty’?